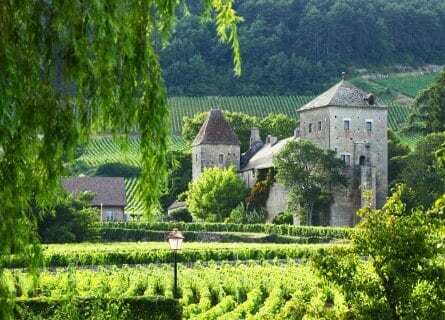 The bucolic and scenic wine country of Burgundy whose terroir and “climats” were recently awarded UNESCO heritage status, is the ultimate destination for fine wine lovers and bon vivants looking for an unforgettable gourmet tour in France. This is the home of the world’s best Chardonnay and Pinot Noir, with mythical wines from Meursault and Vosne-Romanée featuring in many a wine collector’s library. While vines are thought to have arrived in Burgundy from Greece via Marseille around 600 BC, it was the Cistercian and Benedictine monks who were responsible for the careful cultivation of the first vineyards in the region. The 1100-year-old Benedictine Abbey of Cluny was one of the most important and powerful spiritual capitals in medieval Europe and it was there that the monks cultivated the first quality and terroir conscious Pinot Noir and Chardonnay. They delineated many of the same vineyards boundaries that we still see today! The Cistercians also disciplined vine production and founded the beautiful Clos de Vougeot, which you will visit on this tour. The fabled rolling hills of the Côte d´Or (“Golden Slope”) are the heart of premium wine country in Burgundy and where you will enjoy stellar wines on this private journey. You will taste exquisite reds from the Côte de Nuits as well as taste the “Rolls Royce of whites” from the Côte de Beaune. Apart from fine wines, Burgundy is also a food lover’s paradise. Household names like Boeuf Bourguignon and Coq au Vin originate here. Local delicacies in the region include Charolais beef, Dijon mustard, blackcurrants (used to make the famous Créme de Cassis for Kir cocktails), Chanterelles/Morels/Ceps and over 100 other mushrooms, and there is a treasure trove of mouth-watering cheeses to be enjoyed here. Some great ones include Époisses de Bourgogne, Abbaye de Citeaux, Clacbitou, and Délice de Bourgogne. Tour and taste your way through the very best of Burgundy! Get in touch with us for more information on this luxurious private tour. This morning, you will start your tour in Beaune. Arrive by train or our chauffeur can collect you wherever you need to be picked up. Welcome to Burgundy! This afternoon you will kick off the wine tour with a fun private wine masterclass at the L’ École des Vins de Bourgogne. Enjoy an introduction to the complexities and history of Burgundy’s wine. 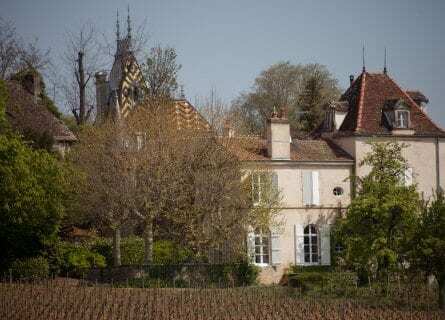 After the French revolution in 1789, the vineyards were seized from the church and aristocracy, and broken up into smaller holdings that were in turn broken up again into smaller parcels after new inheritance laws. 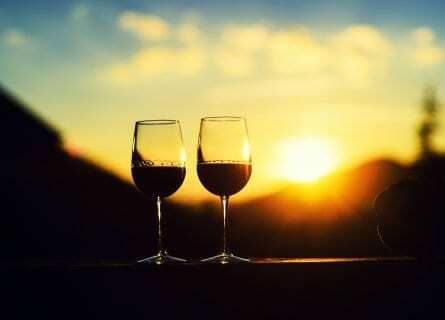 A network of Négociants (brokers) emerged and they became specialized in selling wine from tiny, very localized areas. They are even still an essential part of the Burgundy wine business today. After an entertaining and insightful tasting, relax at your hotel or go for a walk through beautiful Beaune. 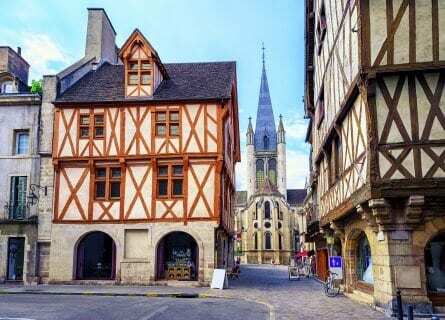 Enclosed by a 13th-century wall, Vieux Beaune is a visual treat, with quaint narrow streets, timber façades and effortlessly charming bakeries, wine bars, and pâtisseries. Your welcome dinner tonight is at the Michelin starred Le Benaton. Savor creative cuisine and local wines in their pretty stone dining room, or in the Italian style garden courtyard weather permitting. Start the day with a private tour and tasting at the iconic, family run négociant Joseph Drouhin. Visit their absolutely beautiful cellar in the historic Duke of Burgundy’s Parliament building, built over 2,000-year-old Roman remains. Taste 6 (of their 60) fine wines. Lunch then will be light at the convivial Maison de Maurice wine bar. Wine won’t actually be included in your meal, giving you a chance to taste various wines by the glass, along with your local cheese, charcuterie, terrine, quiche, and small bites. Some fresh air, architecture, and history will come after lunch. 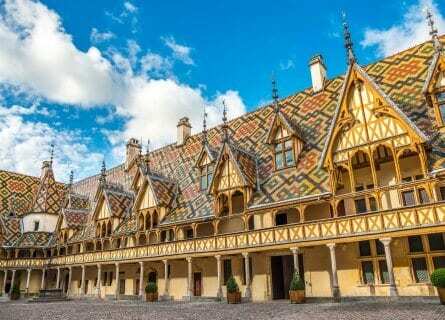 The emblematic Hospices de Beaune (also known as the Hôtel-Dieu de Beaune) was built in the 1400s during Burgundy’s Golden Age, as a quite spectacular jewel box beautiful hospital for the poor. Indeed, it was a functioning hospital up until the early 1970s. It holds the now mythical wine auction every November, a tradition started in the 1860s as both a way to raise money for charity for the poor and also to celebrate the new vintage from the property’s own vineyards. Your guide will talk you through the fascinating history and take you through the wide range of rooms and halls onsite like the ancient pharmacy and laboratory, the collection of Flemish tapestries and more. After an insightful visit, enjoy a short, pleasant walk with your guide to your next Burgundy wine tasting at the highly esteemed Bouchard Père et Fils in the gorgeous Château de Beaune. Enroute you might pop into the Fallot Dijon mustard shop and mill. La Moutarderie Fallot is a historic Burgundian family business, trading since the 1840s. The neat thing is the shop is in the original building, and they still make their mustard with the traditional stone grinders. Their “Pain d´epices” (gingerbread mustard) is astonishingly delish! Pick up some goodies here. Carry on with one last very interesting private wine tour and tasting at Bouchard, and then the rest of the early evening is yours in chocolate box pretty Beaune. Hit the road this morning for the Route des Grands Crus this morning, fine wines are in store. First stop is at Henri de Villamont, a local legend. The property is really special, with a beautiful house and vineyard-terraced hillside. Taste both whites and reds from this excellent property, and then sit down for a fantastic wine tasting lunch, which will be arranged for you at the wonderful Domaine Comte Senard in Aloxe-Corton. Visit their 14th-century stunning cellar before sitting down to a relaxed wine lunch of classic cooking, in their bright and cheery dining room. An interesting architectural wine château visit is next at the alluring Château de Meursault. The wines made here are pleasant (not high end) and refreshing, but the object of this visit is really to breathe in the history and admire the beauty of the property, as there are few like this in Burgundy. Not many estates can claim 1,000 years of history! You will visit the magnificent Cistercian wine cellars, and finish with a Grand Terroir Tasting of their most prestigious crus. In the late afternoon, check in to the wonderful Château de Chassagne-Montrachet where you will have exclusive use of the Château. What a treat. Relax and settle in. You will sleep in a magical vineyard tonight! We suggest dinner in nearby Pommard at Aupres du Clocher, very popular with the locals and with an incredible wine list. Today you have a later start, to take advantage of the lovely grounds and Château. You can go for a bike ride or a jog in the vines, check out a contemporary art exhibition, shoot a game of pool, relax over a cup of coffee and a book. 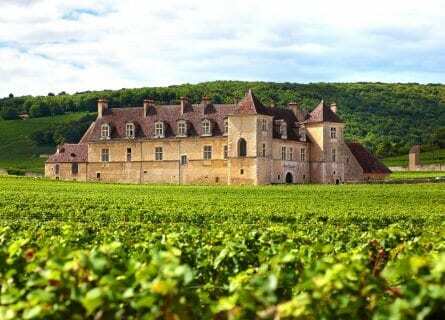 At 11 a.m. you will enjoy an onsite private cellar tour and wine tasting lunch at the beautiful Château de Chassagne-Montrachet. You will love the striking cellars, which date back to the 11th century. After lunch, transfer to the captivating Château du Clos de Vougeot, where you will have some free time to wander around the vines and museum, take some photos and enjoy the panorama. The walled 50-hectare vineyard, founded in the 12th century by the monks of Citeaux, amazingly is divided up amongst 80 owners! 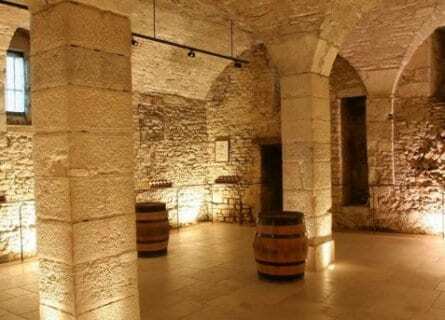 The storied and much loved Château was also built for the monks (to house them, as well as their wine cellar and press), and is now home to the Chevaliers du Tastevin- rock stars in the wine world. Next in store is a private tour and tasting at Château de La Tour in Vougeot, whose parcel in the grand cru Clos de Vougeot is considered to be one of the very best. Enjoy! Then head to the ancient capital of the Dukes of Burgundy- lovely Dijon – in the early evening. Check in to your boutique, primly located hotel and enjoy some free time. Lively Dijon is a beautiful cosmopolitan city with a postcard-pretty medieval core. Renaissance mansions and darling half-timbered houses make up most of the historic center. Chic shops, historic pharmacies and bakeries, and an abundance of artisan mustard makers line the cobblestoned back streets. Convivial bistros and Michelin starred gourmet meccas grace the town and you are spoiled for choice when it comes to wining and dining. Dinner tonight is gourmet-all-the way at Two Michelin starred l’Hostellerie du Chapeau Rouge, feast on a tasting menu with wine pairings. Meet your driver this morning after a wonderful breakfast, and head to leading premium estate Domaine de la Vougeraie in Premeaux-Prissey, just next to cute Nuits St Georges. This ambitious domaine have almost 40 hectares under vine, and they make a wide range of wines from 30 appellations! You will taste some of their best ones. Another private tour and wine tasting are next at Domaine Rene Leclerc in Gevrey-Chambertin. Lauded by Robert Parker, for better or for worse, this tiny high-end wine company produce celestial wines like their old vine Rene Leclerc Clos Prieur and their cellar worthy Premier Cru Les Lavaux-St-Jacques. Taste a range of wines and enjoy a chat with your effervescent hosts. You will love the casual and cozy lunch which will follow at Domaine Trapet. It will be Table d’hôte with soul-warming Boeuf Bourguignon and estate wines. This venue is so cute, with a big open fire, wood beamed ceilings, contemporary furniture and French windows overlooking the garden. After lunch, head to Marsannay for your last wine tour of the Côte d´Or at the Château de Marsannay. A vertical tasting will be organized for you including a refreshing rosé, considered to be one of the best in France and perfect for the late afternoon when your palate will be more saturated. In the early evening, you will enjoy the scenic short drive back to Dijon, and some free time. Dinner is on your own tonight with our tips, in Dijon. Chablis is the most northern sub-region of Burgundy, and of course known for its supremely elegant, minerally Chardonnays. You will visit two of the best, most sought-after wine estates- Domaine Laroche and William Fevre. It’s a 90-minute drive northwest to Chablis, so sit back and either rest your eyes or enjoy a good-natured conversation with your charming chauffeur. You will arrive by 10:30 a.m. At your first port of call- Fevre. The Chablis made at Fevre is quite irresistible! And the quality of their hospitality here is renowned, you will be made to feel very welcome, and learn all about the region. Taste flagship wines and special ones like the Grand Cru Les Preuses or the Premier Cru Vaillons. Before lunch, stop at the beautiful Domaine Laroche for a relaxed tasting and a visit to the vineyard. An easy going bistro lunch is next at Au Fil du Zinc, a classic. On the way back to Dijon, you have two more memorable experiences. First, is a visit to the hill topped Vézelay, one of Burgundy’s most bewitching hamlets. Its Benedictine abbey dates to the 9th century and houses the relics of St Mary Magdalene, on the pilgrim’s route. The basilica is exquisite and UNESCO protected. Enjoy some free time here to explore and be inspired. 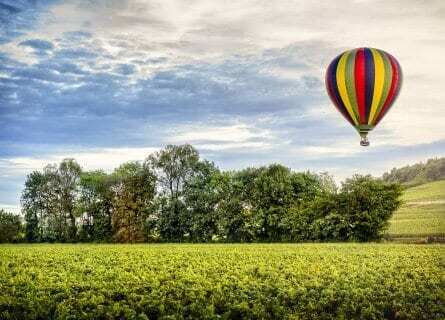 Before returning to Dijon, you have a highlight of this trip next: a balloon ride over the peaceful countryside and crisscrossed vineyards. Enjoy a toast of bubbly when you land, what a thrill! The evening is yours to grab a bite at the hotel or venture out. This morning you have a fun treat in store: a private guided tour of the 19th century Les Halles market, designed by Gustave Éiffel. The displays of fresh produce are incredible, and the aromas of pungent cheeses, ripe fruits, and freshly baked bread will have your tummy rumbling fairly quickly. Shop with your chef host for your ingredients, and carry on to an elegant nearby flat where you will cook a three-course meal together, sipping wine and enjoying a giggle throughout. Sit down and enjoy lunch with your chef, the fruit of your efforts- with a beautiful wine of course. After lunch in the late afternoon, you will appreciate a digestive walk through lovely Dijon. You will have your own certified art guide to show you the “best of”. A visit to the Burgundy museum (musée de la Bourgogne or musée des Beaux-arts) can be included and is fascinating and a very worthwhile stop. Your guide will share fun anecdotes and oddities with you. Stop and make a wish on the tiny stone owl, carved on the exterior of the beautiful Église Notre-Dame. Legend has it that good luck will come your way if you give the owl a little rub with your left hand. If you are able for it, our guide will take you up the 15th century Tour Philippe le Bon in the Palais des Ducs (just over 300 steps) and you can enjoy dramatic views over magical Dijon from the top. Dinner tonight is a relaxed and very cozy affair at wine lovers haunt Dr. Wine. Enjoy light dishes like basil marinated shrimp with lemon cream, thyme scented roast baby lamb chops and cherry Clafoutis, with wines from Chassagne- Montrachet, and Chambolle- Musigny. This morning (or afternoon, check out is at noon), at your preferred time, your chauffeur will transfer you to your next port of call such as the Dijon train station. We hope you had the time of your life on this enchanting journey through the Burgundian wine country!